After my men’s week social campaign I thought I’d pop a few of the top questions I received and some solutions to dealing with these health problems. How to deal with wind? Eating too quickly… yes some of us do like to wolf our food down! But if we don’t chew properly, this can mean we don’t break our food down sufficiently and don’t activate the release of much needed digestive enzymes. Take time to eat slowly, chew your food, take a few breaths, have a chat with your family… your gut will thank you for it! Is it the FODMAPs? There are certain groups of foods, known as FODMAPS, which can increase fermentation in your gut. These include lots of very healthy foods such as broccoli and cauliflower and for some people when they eat too much of these, this can cause excess wind. Also I find with my clients that eating too many nuts (especially when they don’t chew them properly) can also cause excess wind and bloating. So slow it down again… chew them well… and perhaps try ground nuts, soaked nuts or nut butters and see if this helps. How to get men eating healthy food and avoiding junk food? Also if you’re cooking for your partner, then try making their classic favourites more healthy. For example, if you’re making a chilli or bolognaise, sneak in as many veg as you can. Grate courgettes and carrots on a lemon zester, they won’t even know they are there! Try to reduce cheap meat and replace with good quality meat, perhaps bulking out with 50% kidney beans or chickpeas to save money. 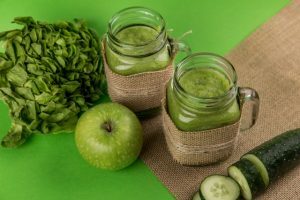 Why not put a smoothie into their hand when they get up in the morning… but don’t overdo the fruit, just add a handful of fruit, a handful of greens and something like a banana (frozen is ideal) or avocado to make it nice and creamy. How to wean my fella off sugar? So talk to your son/partner/nephew about how much sugar is in their favourite sugary things. Get them to do the sugar experiment with a glass and teaspoons of sugar, and work out how much you’re both having each day. Perhaps do a competition to find out who eats the most sugar? If they love a cake, perhaps you could swap out the sugar for Xylitol which has a much lower glycaemic index, and you only need 50% of the normal amount of sugar in baking. Or try adding some dried fruit, banana or berries to cakes to naturally sweeten them, or even some grated carrot. (Great way to sneak in the veg as well!) It’s a tricky one trying to get family members to change… but stick at it, because you’ll be doing so much for their health long term! You can see my Instagram posts for other hints and tips regarding men’s health here.